Until 2059-2060 fiscal year, Myanmar is expected to repay original loans and interests for the total external debt of 10.20 billion USD, according to Union Parliament Public Joint Accounts Committee’s the findings and report on the mid-term debt management strategy 2018. Reading news reports coming out of Myanmar, I am always taken with the debate over the impact of China’s Belt and Road Initiative (BRI). Rainbow flags flew high and gay anthems blasted out over Rangoon’s river as a flotilla of boats took to the water of Myanmar’s biggest city on Saturday for the country’s first-ever Pride boat parade in a sign of growing acceptance for LGBT rights. Myanmar forest authorities have seized 63 tons of illegally harvested timbers from a forest reserve in southern Bago region, the official Global New Light of Myanmar reported Sunday, quoting the Forest Department. Newly harvested green gram has begun entering the market in the Thongwa Township of Yangon Region, with growers selling it at a high price, according to wholesalers. 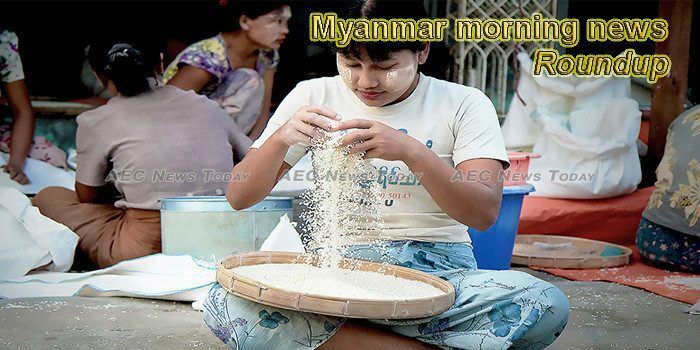 Myanmar’s exports between 1 October and 11 January in the 2018-2019 fiscal year touched a high of over US$4 billion, a rise of nearly $284 million compared with the corresponding period of the previous fiscal, according to data from the Ministry of Commerce. Following its substantial growth last year, Grab, a Singapore-based technology firm providing the most popular ride-hailing service in Myanmar, announced on Thursday its plans for expansion in the market, according to Alvin Loh, acting country manager of Grab Myanmar. The Yangon Region Gold Entrepreneurs Association has sought a license for gold trading through its mobile application from the Department of Mines, under the Ministry of Natural Resources and Environmental Conservation, said U Myo Myint, the chair of the association. During a visit to Sagaing Region this week, Myanmar State Counsellor Aung San Suu Kyi spoke of the importance of improving the country’s education system to fit in with a changing world. Upper House MP J Yaw Wu from the National Unity Party representing Kachin State Consitiuency-1revealed he refused to accept the bribe from the Chinese Power Investment (CPI) Compnay in order to keep silent about the Myitsone Dam Project, at a press conference at Real Link Hotel in Yankin Township in Yangon on January 26. UN rights envoy Yanghee Lee says holding perpetrators to account for crimes is necessary before refugees could return. Myanmar’s recent economic opening has prompted a dramatic upsurge in access to mobile phone and Internet technologies. Vietnam Dairy Product, also known as Vinamilk, will open its first dairy factory in Myanmar in 2019 to meet increasing demand for its products, said a source close to the company in Ho Chi Minh City this week. The Myanmar-China Friendship Association on Saturday offered scholarships to 88 Myanmar outstanding needy students. A total of 18 people from villages and internal displaced persons camps in Sittway, Myanmar’s Rakhine state, have been prevented from illegal immigration to Malaysia, Myanmar News Agency reported Sunday. BMW, an automobile company from Germany, introduced BMW X5 in Myanmar at the Yangon Convention Center in the compound of Inya Lake Hotel on January 23. The chief of Myanmar’s Ministry of Information on Saturday lauded the “effective” functions of state-run media organizations in the Philippines. In recent weeks, Myanmar has seen renewed violence between security forces and an insurgent group called the Arakan Army. Since fighting broke out in Rakhine state in December, at least 26 military personnel and Arakan Army fighters have died and some 5,000 civilians have been displaced, according to the United Nations. It’s the group’s most prolonged period of violence with the military since its founding a decade ago. Ma Khin started a restaurant to shelter and train street kids, and it has involved the occasional heartache but also fulfilment. She is one of CNA’s Champions for Change. Contestants ran a stiletto race and swirled hula hoops at a park in Myanmar’s biggest city on Sunday in the Drag Olympics as a highlight of the Yangon Pride festival. UN Special Rapporteur for Human Rights in Myanmar, Professor Yanghee Lee, on Friday called for the Myanmar Army Chief, Senior General Min Aung Hlaing, to be prosecuted for genocide against the Rohingya. The Government of the Union of Myanmar is celebrating significant milestone achievements as it embarks upon the second half of a two-year, USAID-funded capacity development project in partnership with the Pacific Disaster Center (PDC) and the Association of Southeast Asian Nations’ AHA Centre.